I got this app for free and still feel like I paid too much. 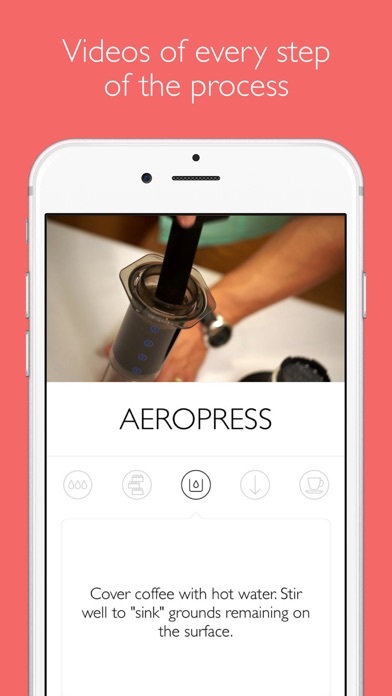 Essentially, it gives pictures and descriptions of espresso-based drinks. The same information is readily available over the Internet. Other reviewers have described this app as “lazy,” and I agree. There is so much more information that could have been included. For instance, the attributes of different types of coffee beans (e.g. Arabica vs. Robusta). Or how about the characteristics of different coffees (Kenya vs. Sumatra) in terms of flavor, acidity, earthiness, etc.? 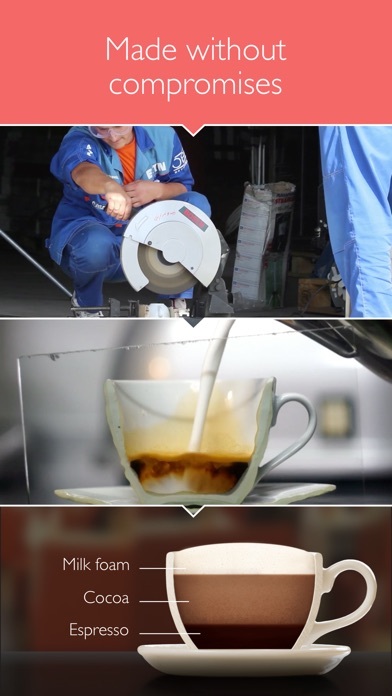 Also, I could think of a number of coffee brewing techniques not included here. I know the focus of the app is plainly on the “elite” brewing methods. But lots of people who haven’t “graduated” to Keurig still use drip machines. Some of us might still have a percolator that gets pulled out for camping trips. And then there’s a concoction known as “cowboy coffee.” Moreover, you discuss Turkish coffee. What about Greek and Arab coffees? Lots of work is needed here. 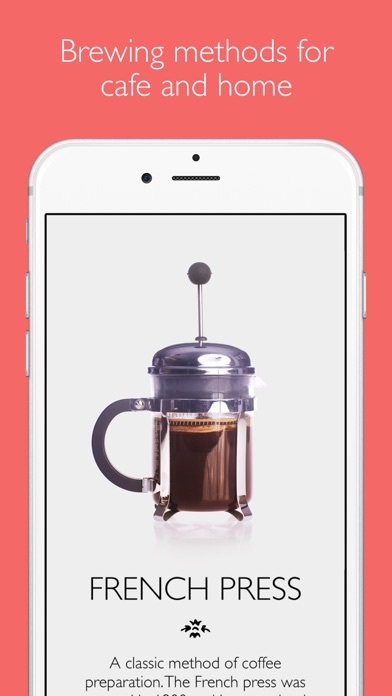 Great app for great coffee! 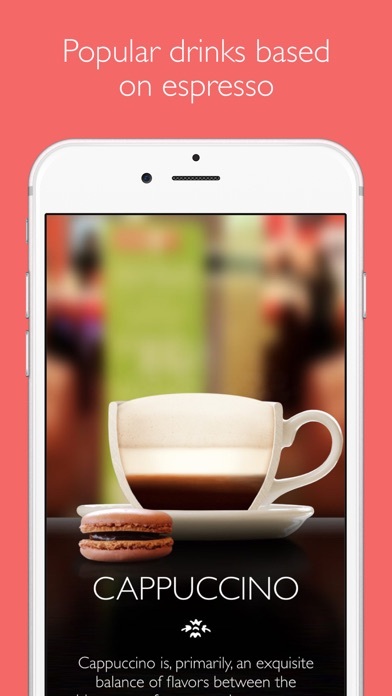 What more could one ask for in a coffee app? One can see the variety of drinks to choose from, visual ratios* for the ingredients in each drink, instructions on how to prepare each drink, plus there’s even a video that demonstrates how each drink is made. There’s even a bonus section on the different styles of coffee which can be made and how to make them. *Note: I did say that the app gives visual ratios for the ingredients not measurements for the ingredients. For some folks this might be a problem, but for me, personally, visual ratios allow the user some flexibility. All in all, a great app for coffee lovers! 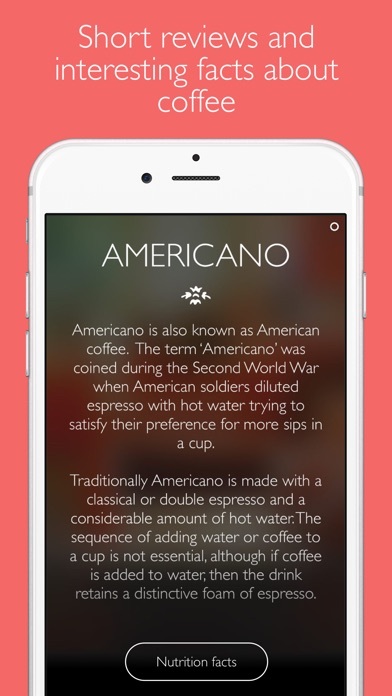 Great and gorgeous app, but hoping to add more types of coffees. No ratios given?! I know it’s easy to find ratios online and preference also comes into play but coffee apps should be a one stop place, there’s much better apps out there (some for free, most for less than $3) they include ratios and timers. This one is a waste. I don’t see how this has any good ratings because the “recipes” don’t include ratios. There is no measurement provided for quantity of coffee vs water. I can’t believe this actually cost money. Boo. No variations or instructions on different drinks but an excellent list of ideas that might peak your interest.